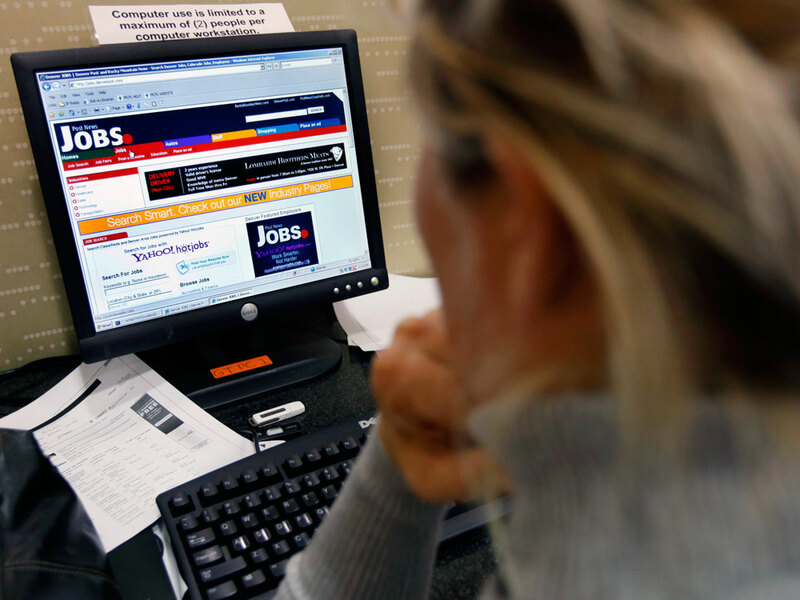 New Generation Of Sites Refines Online Job Search New job search sites use improved search technology to pair job seekers with opportunities that match their skills and goals. But perfected online tools can only do so much in the face of a dismal job market. A Maryland woman searches online for a job at a public library in 2009. According to the latest government jobs report, nearly 15 million people were unemployed last month. That's a lot of job seekers competing for a limited number of openings. Some are turning to a new generation of job Web sites that use targeted search technology to play matchmaker. But for many, it hasn't been love at first sight. Michalyn Bauman has been actively job hunting for about a year. In that time, she says she has applied for at least 100 jobs, both at and below her experience level. She says it has been a bit like throwing resumes into a black hole. She's gotten very few responses, even automated ones. Bauman would like to find a marketing job at a medical devices company near her home in Orange County, Calif. That's what she was doing before she took a couple of years off to raise her kids. But now her husband is out of work, and the job search is getting urgent. Every day, she visits four or five job search sites like Monster and CareerBuilder. "It's pretty much the same," she says. "You see the same jobs posted everywhere." Along with a few legitimate prospects, Bauman says these sites are full of offers for degrees from mail-order universities and sales opportunities with Avon. "You start getting exhausted just filtering through the junk," she says. But for the last month or so, Bauman's daily job search has included a visit to Jobfox, one of the newer job matching sites. She says she likes the site because it is easy to navigate and doesn't have junk advertisements, but says she would like it even more if it led to a job or even an interview. Rob McGovern, the founder of Jobfox, says he sees his company as akin to eHarmony, but for jobs instead of dates. McGovern started CareerBuilder back in the 1990s, but he says job search algorithms have come a long way since then. "You know, when the first search engines came along, you had to be a search expert," McGovern says. "You had to do this thing called 'Boolean search' to put search terms in and really ferret out the data. And then along came Google, and [they] said, 'We're going to build a smarter search engine.' Well, the same thing's happening in jobs." Rather than just posting a resume, Jobfox users fill out detailed profiles that get very specific about their skills and hopes for a new position. Then, McGovern says, candidates are matched up with job postings that are just right. "When you look at 10 jobs on our service, we want you to say, 'Wow, all 10 of those, I'd be good for that,' " McGovern says. "And we want the employer that sees you to say, 'This person's really qualified,' as opposed to, 'Here's yet another resume I didn't want.' "
Mark Ciabattari has applied for about 20 tech industry positions through Jobfox, but so far those leads haven't resulted in much. "For me the bottom line is: Has anything netted into an interview?" he says. "And at this point, the answer is no." A handful of sites promise more targeted job searching, including Indeed, The Ladders and QuietAgent. Monster is getting in on the matchmaking, too, with a new "power search" that's still in beta mode. But they still all face one big obstacle — the job market itself.